Looking to rent a portable truck scale or vehicle scale? Then you’ve come to the right place. Loadmaster has three types of portable truck scale rentals, wheel load scales, low profile axle scales & full sized truck scales. Wheel load scales (3” tall) are wirelessly connected and multiple units can be used to weigh individual axles or entire trucks at once. Axle scales (6” tall) suitable for individual axles (7’ long), tandem axles (10’ long) or tri-axles (15’ long). 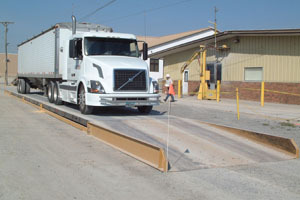 Multiple axle scales can be used to weigh entire trucks at once. Full sized truck scales are available in varying lengths from individual modules starting at 20’ long through multiple module setups 70’ (and longer) for tractor-trailer rigs. Whether you are looking for a short term or long term portable vehicle scale rental, Loadmaster has the perfect solution for you.